Many people see their check engine light come on and simply ignore it. Unfortunately if you fall within that description, your vehicle will soon suffer damage. It may not happen immediately, but the check engine light always goes on for a reason. The check engine light is a warning light, alerting you that something is wrong with your vehicle. Something may not necessarily be broken, but that small issue could turn into a much larger problem if neglected for too long. Whenever the warning light comes on, bring in your vehicle to Rocket Auto Repair and our ASE certified master technicians will diagnose the problem and correct it and get you back on the road. Our team utilizes the latest technology in auto repair to perform repairs to your automobile and correctly read the error codes behind your check engine light. Depending on the vehicle, a check engine light could mean a variety of things. Over 300 different problems, in fact. Your vehicle’s onboard computer monitors many different systems within your automobile and when it detects a problem it will turn the check engine light on. To properly diagnose the meaning behind the mysterious light you have to bring your vehicle into an auto repair shop. Once at our shop in Monmouth, check engine light technicians will use special instruments to tap into the onboard computer and get a read the error codes. The error codes indicate which system is at fault. 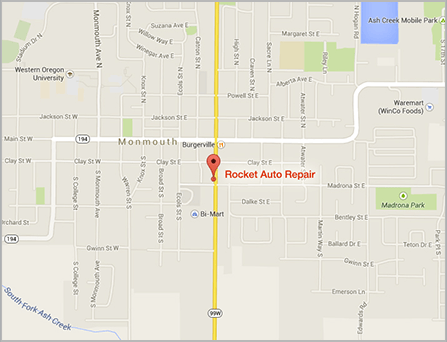 From there, your trusted auto mechanic can perform the necessary repairs. Bring your vehicle to Rocket Auto Repair and ASE certified mechanics will diagnose and correct your check engine light! Can I Drive if my Check Engine Light is On? The short answer is yes, but you should refrain from driving as much as possible. It is safe to drive to your local trusted auto mechanic to diagnose the issue but it is not a good idea to continue driving. As mentioned earlier, the check engine light does not signify immediate danger, but rather a problem is occurring and that the problem will worsen and potentially cause further damage to your automobile. In our experience, ignoring the check engine light often means an expensive repair is around the corner. To avoid paying hundreds, we recommend taking your vehicle to our Monmouth check engine light specialists so we can diagnose and correct the issue. A trip to us will always be less pricey than excessive damage caused by neglecting your check engine light. NEVER Drive if Your Check Engine Light is Flashing! It is never safe to drive when your check engine light is flashing. A flashing check engine light indicates a misfire, which means a serious problem is occurring in your vehicle, such as excess fuel getting into your system. Misfires cause major damage to your vehicle, so if you notice that your check engine light is flashing then turn the vehicle off, or if you are driving then immediately pull over to a safe location and call a local towing company. Once the tow truck brings your vehicle to the nearest repair shop, they can diagnose the misfire and perform necessary repairs. Did you know that older vehicles should have their oil changed more frequently? A Check Engine light that’s on too long can indicate a serious problem. Let us have a look! Belts can wear over time and affect your vehicle’s performance. We can make sure they’re in good shape. We're a Tech-Net Professional Shop!